Inspectors enforce rules throughout our facilities. They check fares, patrol, and play a prevention role among both passengers and employees. They also respond to emergencies and assist transit users in various situations. Inspectors are public officers appointed by the STM’s board of directors. They can issue statements of offence and make arrests. Do inspectors receive special training? Inspectors go through an intensive 14-week training period at the École nationale de police du Québec. Must I identify myself if an inspector asks me to do so? Yes, if an inspector has reason to believe you have committed an offence and informs you of the suspected offence, you must identify yourself. Depending on the circumstances, refusal to do so could constitute obstruction of the inspector's work. You could be issued a statement of offence under the Act Respecting Public Transit Authorities or be charged with obstructing a public official under the Criminal Code. If you continue to refuse to identify yourself, you could be arrested. 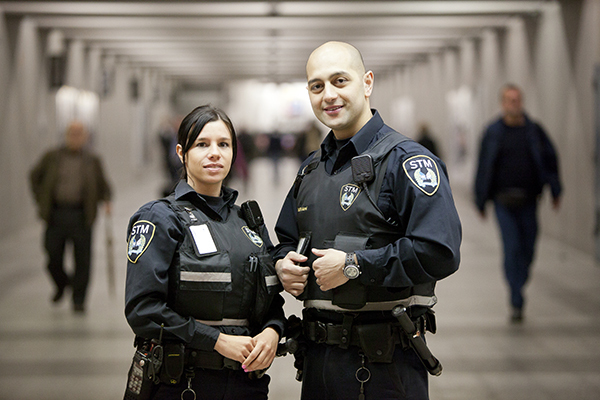 Police officers from the City of Montréal police department (SPVM) are assigned to work directly in métro stations and surrounding neighbourhoods to ensure the safety of passengers and business owners. They are also responsible for reducing the frequency of worrisome and disruptive incidents to ensure the peace of mind of all Montrealers. There to provide you with one of the safest public transit systems in the world.